Sarah Nader- snader@shawmedia.com Richmond-Burton's Blaine Bayer dribbles towards the basket during the first quarter of Friday's game at the E.C. 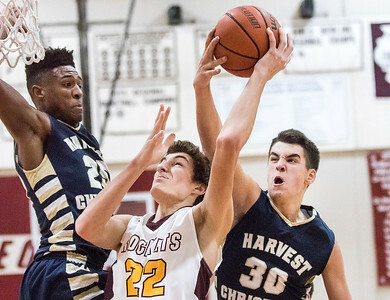 Nichols Holiday Classic against Harvest Christian at Marengo High School Dec. 23, 2016. 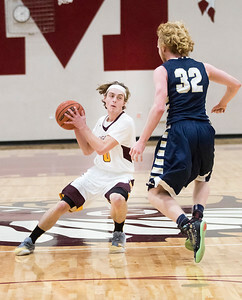 Richmond-Burton won, 80-70. 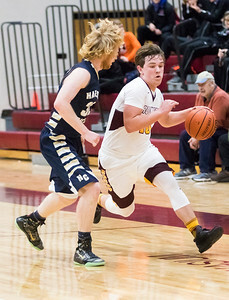 Sarah Nader- snader@shawmedia.com Richmond-Burton's Mark Marzahl dribbles towards the basket during the second quarter of Friday's game at the E.C. Nichols Holiday Classic against Harvest Christian at Marengo High School Dec. 23, 2016. 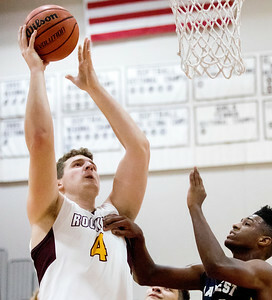 Richmond-Burton won, 80-70. 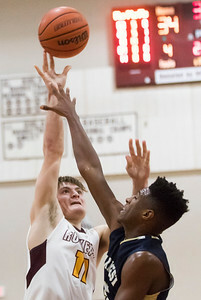 Sarah Nader- snader@shawmedia.com Richmond-Burton's Shane Byrne (center) has his shot blocked by Harvest Christian's Jack Nohava during the second quarter of Friday's game at the E.C. Nichols Holiday Classic at Marengo High School Dec. 23, 2016. Richmond-Burton won, 80-70. 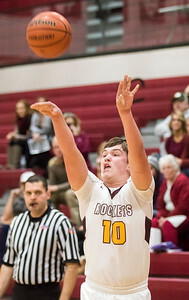 Sarah Nader- snader@shawmedia.com Richmond-Burton's Brady Gibson (left) shoots over Harvest Christian's Brennen Woods during the second quarter of Friday's game at the E.C. Nichols Holiday Classic at Marengo High School Dec. 23, 2016. Richmond-Burton won, 80-70. Sarah Nader- snader@shawmedia.com Richmond-Burton's Mark Marzahl shoots a basket during the second quarter of Friday's game at the E.C. Nichols Holiday Classic against Harvest Christian at Marengo High School Dec. 23, 2016. Richmond-Burton won, 80-70. Sarah Nader- snader@shawmedia.com Richmond-Burton's Joey St. Pierre shoots a basket during the second quarter of Friday's game at the E.C. Nichols Holiday Classic against Harvest Christian at Marengo High School Dec. 23, 2016. Richmond-Burton won, 80-70. 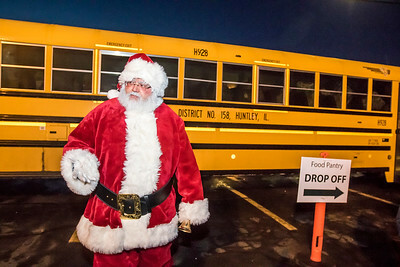 Sarah Nader- snader@shawmedia.com Santa Claus greets people while they drop off items for the Stuff the Bus Food Drive to benefit the Grafton Food Pantry at Pub 47 in Huntley Thursday, Dec. 22, 2016. Sarah Nader- snader@shawmedia.com Joshua Gliszczynski (left), 9, of Huntley and his father, Keith Gliszczynski, hand off items to the Huntley Red Raiders travel baseball team while dropping off items for the Stuff the Bus Food Drive to benefit the Grafton Food Pantry at Pub 47 in Huntley Thursday, Dec. 22, 2016. 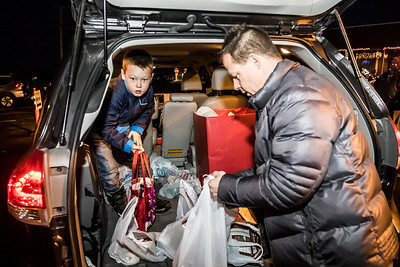 Sarah Nader- snader@shawmedia.com Zach Rysavy, 10, of Huntley loads donated items onto the bus for the Stuff the Bus Food Drive to benefit the Grafton Food Pantry at Pub 47 in Huntley Thursday, Dec. 22, 2016. 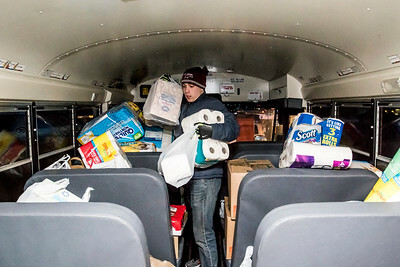 Sarah Nader- snader@shawmedia.com Brian Karlow, 18, of Marengo loads donated items onto the bus for the Stuff the Bus Food Drive to benefit the Grafton Food Pantry at Pub 47 in Huntley Thursday, Dec. 22, 2016. 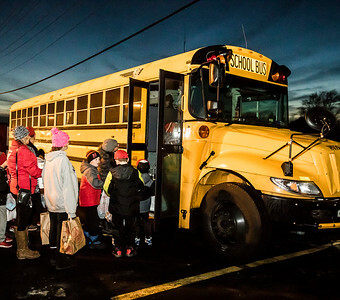 Sarah Nader- snader@shawmedia.com People wait in line while they drop off items for the Stuff the Bus Food Drive to benefit the Grafton Food Pantry at Pub 47 in Huntley Thursday, Dec. 22, 2016.